Meet Baby. Baby is Monkey's new best friend. Monkey loves to mimic Mom and Dad and has observed us take care of little Bear. Like a good mommy, Monkey feeds Baby (he even tried to breast feed her once), changes her diaper, pushes her in a stroller and tucks her in bed for naps. Baby goes everywhere with Monkey. Even though Monkey loves his baby doll and will occasionally play with his sister's Barbies he still reminds me every day that he is a boy. He loves his football, pushing around his toy cars, and wrestling with his brothers. Monkey is a rough and tumble boy who also has a sweet tender side too. How do you feel about boys playing with baby dolls? Do you think it is healthy? My husband wants Monkey to learn how to become a good father someday. He thinks that playing with dolls is good for him. I see his point and find Monkey's new attachment quite cute. As long as he still plays with his football and rough houses with his brothers then he can play with dolls, barbies and his kitchen set too. Did I tell you that Monkey is quite the gourmet chef too? He even has his own kitchen. 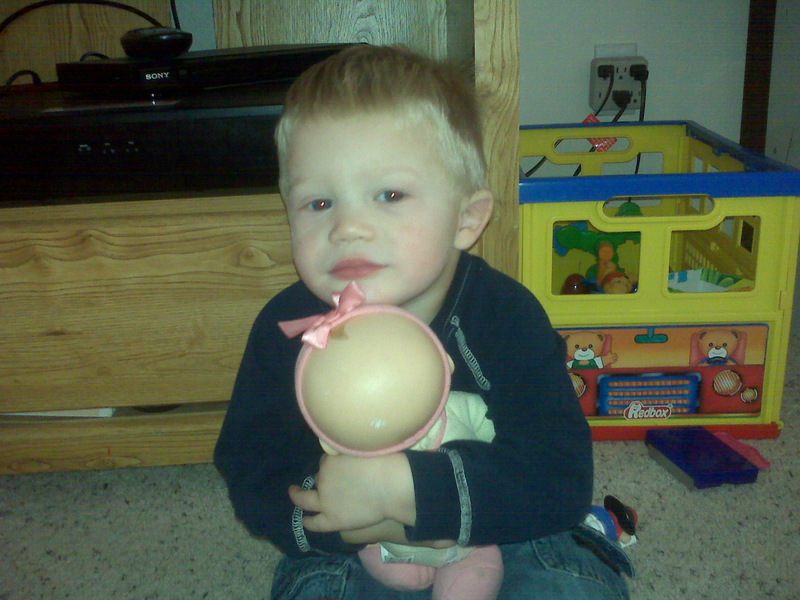 Our boys have played with baby dolls at one time or another. I even wrote about their doll house which has housed many of their action figures at one time or another. I think it is great when little boys and girls play with dolls and learn how to take care of babies. My daughter also use to breastfed her baby since she saw me do the same with her brother. I think boys and dolls is totally fine! My brother freaks out, however, if his boys even try to pick up a doll. I'm obnoxious and let them play with the dolls we have when they're over. =) Silly to me to make such a big deal out of it. That is very cute :-)! I'm glad your family is doing well! I'm sorry it has been awhile -- we had a baby and moved to a new state all at the same time, and were without internet for awhile! But even though I ended my blog, I read my favorites (i.e. yours) when I get the chance!